Teresa, welcome to Reviews and Interviews. I'd like to introduce readers to you and your fiction writing, so have a few questions. I've always enjoyed writing, but I didn't know that I could. I didn't know that I couldn't either so a few years ago I just sat down and did it. The book itself is inspired by a case I was involved in as an attorney in juvenile court. But I wanted to write about the horrendous child abuse problem we have in this country. I was concerned that people would not read it if I wrote a non-fiction book because it is a very difficult thing to read or talk about. By writing a legal suspense novel, I can get information out there to the public and entertain them at the same time. Is The Advocate your first book, or the first one to be published? 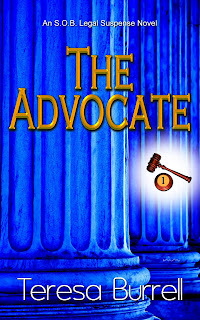 The Advocate is my first book. I haven't written the sequel which will be released this year. Please tell us a little bit about The Advocate. In The Advocate, Sabre Orin Briown's job is to protect her minor client. Her obsession is to solve the mysterious disappearance of her brother. When her search for her brother and her career as a juvenile court attorney collide, she has to protect herself and her the child from the obscure and treacherous truth. I learned a lot, not the least of which is that I love to write. The first took only about six months, but then it was followed with many rewrites. The second about nine months but with far less editing. I try to write first thing in the morning. I wake up around 5 or 5:30 in the morning. That's when I like to write best. Sometimes though, when I get on a roll, I'll keep writing all day. In order to keep writing and not lose ground even when I'm not sure where I want to go with something, I cross-examine myself without leading. And I will type out very basic (often boring) things that I later take out of the story. I love to go to movies and eat the popcorn. I will often treat myself to a movie when I reach goals I've set for myself. Other than spend time with my family I don't seem to have much time for anything else besides work. But I love my work. I enjoy not only the writing, but the marketing, so I'm a happy camper. Keep writing. Whether you are published or not, keep at it. If I can do it, so can you. Do you have a website and/or blog where writers can learn more about you and your writing? What are the links? My website is http://www.teresaburrell.com. My blog is http://www.teresaburrell.blogspot.com, and I also have a facebook fan page. It is Teresa Burrell Fan Page http://tinyurl.com/yzlfncv. Right now I'm offering a free book to any library if they get 10 people to join my Facebook fan page. All someone has to do is join my fan page, let me know the name of the library they want to host, and then get nine others to do the same. Once I have ten for any particular library, I'll send a free autographed copy directly to the library. Thank you for your time, Teresa! That's a great offer for readers and fans, I hope folks take advantage and pull for their favorite library. The Writer's Chatroom presents Elaine Isaak. Hi Rick, welcome to Reviews and Interviews. I'd like to introduce you to my readers, so I have a few questions for you. A few years ago I began shifting my focus from primarily being a divorce attorney, to doing more and more mediations, where I help people work through their divorces with as little trauma as possible, rather than going through the typical court-fought divorce. 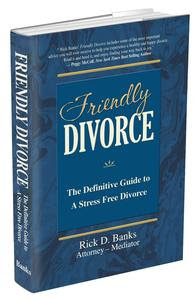 I realized that having a "Friendly Divorce" can save people thousands, and often tens of thousands of dollars that could be better spent elsewhere (e.g., like their children's college funds, or vacations, or purchasing a home, etc.). So, that's when I knew I needed to get the word out to as many people as possible that there is an easier way to divorce, and that I needed to write a book teaching people how to do that. What inspired you to write Friendly Divorce: The Definitive Guide to A Stress Free Divorce? I decided to become an attorney to help people get through what is probably the hardest thing they'll experience in their lives - a divorce! However, after 10 years I've come to learn that the legal system often makes divorces harder than they have to be - both financially and emotionally. And, although there are some good, ethical attorneys, there seem to be equally as many that don't put ethics, or what's best for their clients, in the forefront of the case. You mean besides the fact that it's a heck of a lot harder than one might imagine? Yes; I learned that for a non-fiction book, tons of research is a must. In my situation, I had to sift through the laws of 50 states and then write in a way that, no matter where you live, you can benefit from my book. How long did it take you to write the book? Are you writing another? Well, when I made the decision to finally write my book, I set a goal to have it completed in 6 months. However, reality set in after a few months and I realized that, for me, that wasn't enough time. As it ended up, I finished right at the two year mark. And no, I'm not writing another one just yet, but I'm getting pretty jazzed about some other ideas I have. What is your work schedule like when you're writing? Was it a challenge to balance it with your day job? My work schedule while I was writing was what caused me to take two years to complete my book. My typical work day is spending 10 - 12 hours at my office taking care of my day job (being a solo practitioner attorney does not lend itself to lots of free time). I would then spend a few hours with my family before going off to my quiet room to write. I usually get up between 3 - 4 a.m. and start writing again. As twisted as this may sound to many who don't consider themselves "morning" people, these are the best times for me - no phones, no televisions, no interruptions. I guess I would have to go back to the time of day I spend writing so early in the morning. Once I get up, get a little bit of coffee running through my system, I can go for hours without stopping because it's go quiet and peaceful at that time of the day. I like scuba diving, camping, spending time with family, and traveling to different places with my wife to listen to Blues Music. Thank you for your time today, Rick. I wish you all the best with your book! The Writer's Chatroom presents Jennie Spallone. Let's focus a bit on your published writing and particularly your second book. Please tell us about Towards Understanding, revised edition. You know, Towards Understanding has to be the most emotional ride I’ve been on as a writer, surpassing the experiences I have ever had in the past in any other career. The revised edition is a collection of 125 non-fiction poems written in chronological order and is available in e-book format. The original version of this book (with 120 poems) is still available in paperback through most online and retail bookstores. Most unusual for poetry books, our publisher released a limited 1st edition in hardcover format in the summer of 2009, we hope to see this repeated at some point in the future. Anyway, the new revised edition (released in late-July 2009 by Booklocker.com) offers 5 new poems, creating an ending that I am much more comfortable with and has other updated sections as well. This book tells the true-life journey of a young pre-teen female growing up on her own, struggling to survive, breaking the chains of inner issues from childhood abuse and neglect, and finally - growing towards understanding of her value & purpose in life, but not quite reaching it. Thus the title… Towards Understanding. The reason behind the release of this raw and emotional book was to show other victims of abuse, violence and neglect that they can live a wholesome life without baggage from the past. Second to that Lillian wanted to provide a roadmap that showed the healing process that victims go through, letting others know they are not alone. People who are involved with victims can learn what that person is going through or will go through and therefore they might be able to provide a better support system. Did you enjoy the process of putting this book together? What did it entail? Well, the exploration as a poet was the most enjoyable part; the reaching beyond what is comfortable to my pen and creating new sounds, new rhythms – trying to create different effects with words. It is a beautiful process. I had numerous poems published in anthologies, won contests or magazine publications or local print publications that gave me the spark of the idea that maybe there could be a book here. Dave helped a great deal in choosing from the more than 300 poems, narrowing them down to those I felt most comfortable sharing with the public and having Dave help me select those that keep with the story-line and focus of the book was incredibly helpful. Dave created the cover, which the publisher loved, based on a photo he took of me on a beach, during one of the many introspective nature walks. There were several really monumental emotional curves when it came to this book’s creation. Going through the piles of poems initially was really heart-wrenching. To see again the self-hate, the suicidal thoughts, the rage; it was really shocking to see it there in raw words. But then as we went through the pile of contemplative creations I noticed a thread of hope was strung throughout, and love… and then a spark of an expectation for a better life. After the book was released I had an immediate sense of regret, a fearful “what have I done?” ringing in my head. This was soon soothed by reader’s reviews and wonderful comments from those the book gave hope to. Poets and poetry critics had very kind, insightful observations about my work and I began to feel validated as a poet as well. Was it I who wrote them? And what do they mean today? To those who need them most. Published in Literary Spot Magazine’s January 2008 issue. Well, Dave and I both have several short-story projects that have been on the back burner for a few years that we are both aching to get back to. We also have a garden book and a cookbook that we’d like to see reach a publisher’s hand one day in the near future. Currently though we have enough on our plates just handling the marketing for these three books in all their formats, and manage our bi-weekly newsletter, daily blog, weekly blog and two radio shows. Initially we focused on creating a platform to work from and thinking about branding – meaning how we want to be seen or how we want people to feel when they think of us. New writers rarely come into the career knowing that it takes a lot of time and energy, sometimes many years, to build name recognition and an online presence. I’ve worked with print media, online and radio media – but my favorite activities are interviews like this one where I appear on blogs, newsletters and e-zines or radio and answer questions that challenge me to respond in a way that interests their readers. Look for part III of this interview on March 10. The Writer's Chatroom presents mystery author Steven M. Forman.